The four decades since 1974 have washed away memories of a year that most wanted to forget even then. 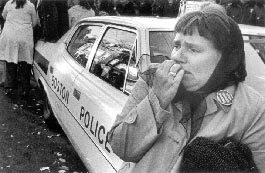 Still, 1974 was a monumental year not just in America's history, but in Boston's, and it should not be forgotten, ever. It was a year when the fabric of society was strained to its tearing point. 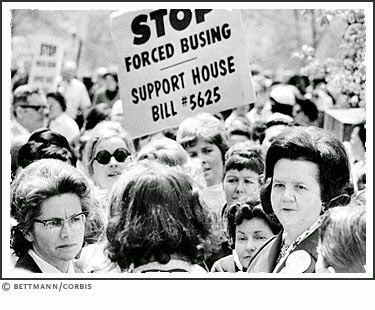 1974 was the year that the city was compelled by federal district judge W. Arthur Garrity Jr. to implement busing. It hit the city like a ton of bricks. 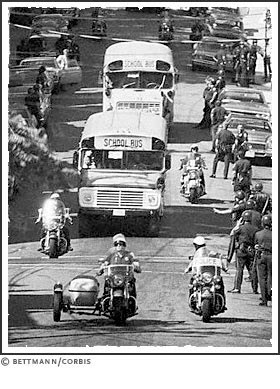 It is very hard today to recall the anger, fear and violence that busing brought, deep and pervasive though they were at the time. Adults stood out daily to protest the arrival of children at school. Motorcycle convoys of police escorted buses every morning. Racial tensions ran very high. The ruling found its origins in a 1960s-era Massachusetts law that ordered the state's schools to desegregate or risk losing state funding. Then, in 1972, a group of black parents filed suit claiming that Boston's school system was unconstitutionally segregated. "Just hours after Boston's schools had closed for the summer on June 21, Judge Garrity issued the historic ruling that had taken him a year to decide. The Boston School Committee had, he said, 'knowingly carried out a systematic program of segregation affecting all of the city's students, teachers, and school facilities and [had] intentionally brought about and maintained a dual school system,'" reported a 2000 Harvard study on the busing crisis. "He knew there was going to be a lot of opposition," Brian LeClair, Garrity's law clerk at the time of the ruling, said in a Boston Globe interview earlier this year. The impacts of Judge Garrity's ruling were immediately felt. Eight-year-old Michael Patrick McDonald had his own perspective on this. As a white kid living with his mother in the Old Colony housing project in South Boston, he had a ringside seat to the turmoil he saw in his neighborhood. In 1999 he sat down to write an account of the times in his book All Souls. 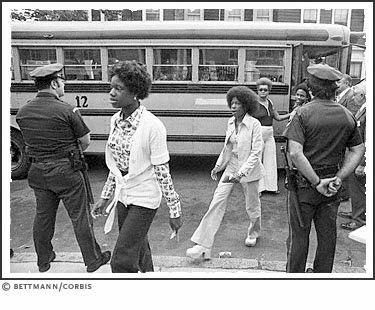 When the motorcade had passed, everyone lingered on street corners in the project talking about "forced busing." It was going to begin in the fall, they said. They all seemed to know it was going to happen, but win or lose, everyone believed in going down fighting. I saw neighbors talking, people I knew had grudges against each other before. 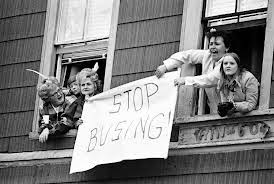 In the following days, I even saw people who were from different parts of Southie getting over their differences to talk about the busing. Mothers from City Point talking on Broadway to mothers from the projects. I couldn't believe it. The whole feeling in the neighborhood was changing. Before long, we kids could cross any turf line. We were united. Some said it was the communists who were making this happen. Still others said it was rich lawyers, judges, and politicians from the suburbs, and that it had nothing to do with the blacks, that they didn't want to come to Southie any more than we wanted to go to Roxbury. In the end it didn't really matter who we were united against, as long as we kept up our Southie loyalty. To comply with Garrity's order, Boston decided to start by integrating the predominantly black Roxbury with the almost entirely white and equally poor South Boston. From today's vantage point, it's hard to image two neighborhoods less likely to integrate successfully. Furthermore, it has been asserted that they were two of the worst performing schools in the district, so what benefit would be derived from conflating them was unclear. The anger that emerged in the largely Irish working-class South Boston swelled and the mix proved toxic. McDonald remembered this. Some of the neighbors raged against "the niggers" more than ever before. But others were starting to talk about how this wasn't about race. That it was about poor people being told that they have to things that rich people don't have to do. Our mothers couldn't get over people thinking that we had something in our schools that blacks in Roxbury didn't have. "Our kids have just as little," they said. "Neither side has a pot to piss in and now they want us to fight over who can piss in what alley." I couldn't believe that there were people who were now willing to admit they were poor. I'd never heard that one before in Southie, especially not in the project. We weren't poor; that was a black thing, being poor. But the ones who talk about us being poor were few and far between, and it wasn't long before the talk became all "niggers this" and "niggers that." Class, race, ethnic tribalism, poverty, a sense of disenfranchisement all fueled the anger and the public reaction that overtook the city. Some neighborhood politicians like Louise Day Hicks exploited it. Boston, the enlightened City on a Hill, was embroiled in one of the ugliest chapters in its history. To manage the crisis, Garrity appointed "masters" to shepherd through the desegregation plan. 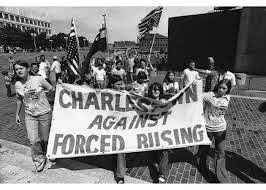 One, Charles Willie from Harvard, noted that unlike the civil rights struggle in the South which was all-encompassing and built its own momentum, Boston's struggles were more isolated from the larger surrounding social context and this isolation allowed a continuous resistance to fester. "On September 12, 1974, school buses set out to pick up 20,000 children—out of a total of 87,000 students then enrolled in the Boston Public Schools—for journeys ranging from several blocks to several miles. But many buses pulled up to their assigned schools with only a few students, or none at all. Only 124 of an expected 1,300 students, for instance, showed up at South Boston High School for the first day of school. Of those 124 students, 56 were black and had come to desegregate the previously all-white institution." Garrity tried to get the universities to become more active partners on the theory that both white working-class parents and African-American parents would feel greater confidence in the desegregation efforts if the many institutions of higher-ed took a more active role in the schools. Boston University president John Silber stepped up immediately, pledging the support of BU in the effort. Harvard was more ambivalent about getting involved and assigned it to a graduate student at the Ed School, according to the Harvard report. Court ordered desegregation efforts continued until 1999, when a group of white parents filed suit to have it ended. Nevertheless, its impacts are wide-felt. The effort was a wrenching one that showed the ugly side of the civic personality of the city. At the same time, it was a genuine and brave effort to undo a pervasive pattern of discrimination. Our school systems have not succeeded in closing the gaps in student performance, with race as an unfortunately accurate predictor. Nevertheless, we are a much more multi-cultural society than we were and the neighborhood and ethnic boundaries that used to define and constrain us have almost entirely disappeared after so many trips through the wash cycle. Though race has by no means vanished from the conversation, income and education differentials play an equally pervasive role as skin color. And of course, forty years ago tomorrow, Richard Nixon resigned the presidency of the United States. The filter of time allows us to see the past through a gauze that reveals the outlines, but obscures the specifics. Photographs pull the gauze away, showing it all in an unblinking black and white. People and places emerge from the past in unnerving, familiar detail.